Discussion in 'Social Discussion' started by C to the J, Jun 30, 2017. I think at this point everyone is sick of me stinking up the work thread talking about Funko so I would like to make a thread dedicated to it. Post your deals, finds, and hauls here. Binxybaby, easterbasketcasey, ducky and 3 others like this. Of course I had a motive in creating this thread. I wanted to show off that I got my first chase!!!! 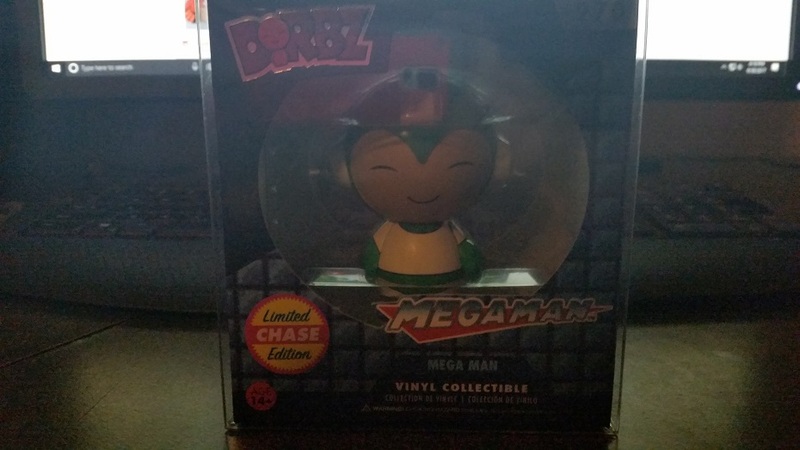 Sadly didn't find him "in the wild" but got a fantastic deal in a lot on Ebay. redtokyoboxers, It's Gamera!, Jaded and 2 others like this. now when you wanna break things playing megaman. instead of a controller can throw mega man against the wall in a rage quit. / i hate mega man but I love. let me conquer you. C to the J and Vanyanka like this. you dont understand mega man raaaaaaage tho. My haul from the last week. I kinda went crazy and decided I had to have all the Castiels right away or I was going to die. Binxybaby, Jaded, Tigerpants and 4 others like this. He hasn't come yet, but I'm very excited for him to get here. scrmcasey and C to the J like this. Most of my Harley Pops. Shelf is up high and I need to get the Star Wars off of the top to fit more. Binxybaby, Jaded, Princess Gina Marie and 3 others like this. You guys are ridiculous and I love you. Vanyanka, C to the J and scrmcasey like this. This is wonderful. Her look translates so well to Pops. I kinda want to get more of her. It gets hard to keep up with all of the different variations. My main concentrations are Harley/Joker, BtVS, Supernatural, Sailor Moon, and Horror. I'm a bit disappointed that they aren't adding more Buffy Pops to the line for SDCC with it being the 20th anniversary. Princess Gina Marie and Vanyanka like this. Not trying to kill your wallet or anything but you should get into the Supernatural Minis next. I love the art style on these ones. Gina is just dying for that pink and white one but haven't been able to find a good deal yet. Thankfully I was able to get her the Arkham mini today after a month of trying. I have all of the Supernatural minis except for the Hellhound. Never managed to find him. I did get the Hot Topic Coach Dean from my first case. The pink Harley came out 2ish years ago right around Valentine's Day. My husband grabbed her as a gift for me and I never saw her again in the stores. And that is the best Harley mini - Gina needed that! Princess Gina Marie, C to the J and Vanyanka like this. I am bummed too. I like the Rock Candy ones but I need more Buffy characters. It's weird they left out Xander, Giles, Cordelia ad Anyanka. Right now, I'm mostly focused on BTVS and Supernatural but I also want to get some of the Kill Bill and Pulp Fiction Pops. I read that they are releasing a Wes Anderson wave sometime this summer and I'll definitely pick up those. Thos are really cool but I can't find many good deals on them right now. I'm on the lookout, though. Love the Leviathan one especially. Yea the Pink Harley is going for $20-25 now so it's just a matter of keeping an eye out until I see a price I'm comfortable with ($12-$18). Agreed so much on the Arkham one. We're up to about 100 minis now and she might just be my favorite out of everything....even though she's not mine. 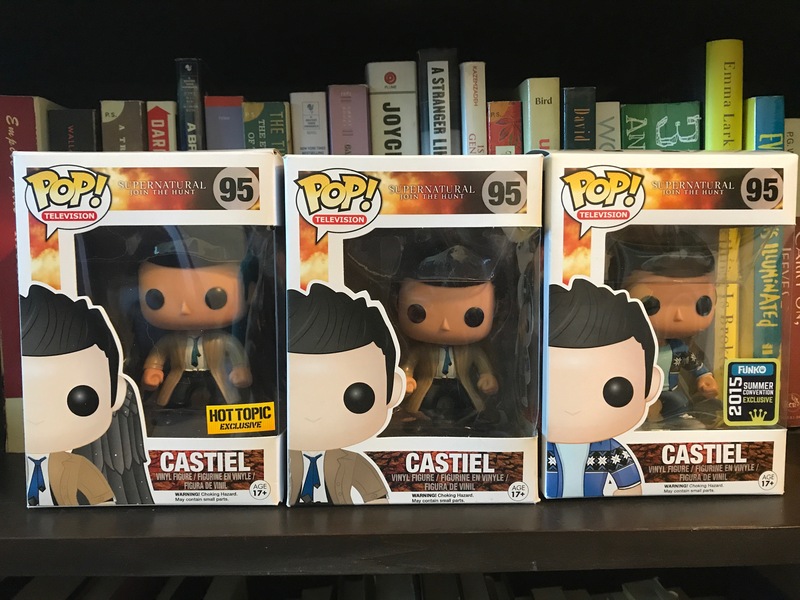 Do you collect any of the other Supernatural characters, or just Castiel? I also want to get some of the Kill Bill and Pulp Fiction Pops. Going to need to start doing a lot more than 200 5s a day. Do you collect any of the other Supernatural characters or just Castiel? I want them all but I just decided t do the Castiel ones at first. I ordered the standard Dean, Sam and Bobby. I REALLY want the bloody ones for everyone and the FBI outfits for Sam and Dean. Especially Dean. C to the J and scrmcasey like this.